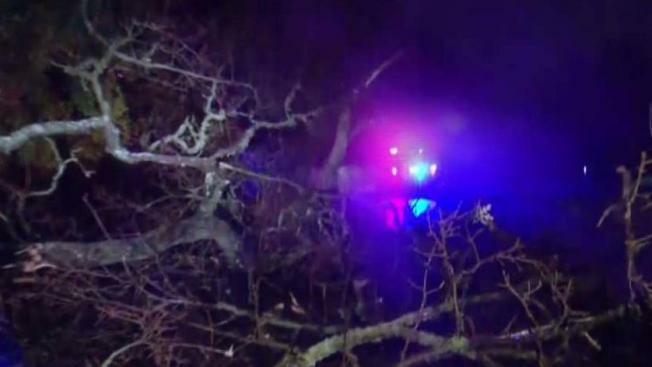 A pursuit in the East Bay on Tuesday came to an end when a vehicle slammed into a fallen tree, according to the California Highway Patrol. Bob Redell reports. A Fremont man allegedly gave a Pleasanton police officer the slip early Tuesday after leading him on a car chase, slamming into a fallen tree and then fleeing on foot. The officer first spotted a blue 2005 Hyundai Elantra in the First Street area around 3:20 a.m. Noticing an equipment violation, he conducted a traffic stop at the intersection of First and Abbie streets, police said. The driver, identified as Marquice McClinton, 31, climbed out of the vehicle and walked toward the officer. His hands were hidden inside his black hooded sweatshirt, police said. McClinton disobeyed the officer's orders to show his hands, prompting the policeman to pull out his weapon. Immediately, the suspect, who was also wearing blue jeans, dashed back to his car and sped away, according to police. The officer pursued McClinton down First Street, then south on Sunol Boulevard, past the Interstate 680 on-ramp and Castlewood Drive. The inclement weather late Monday, however, brought down a nearly 80-foot tree that was blocking Sunol Boulevard. McClinton failed to stop his car in time and crashed into the tree. Police said he hopped out of the car and ran into bushes along the road. Pleasanton police officers set up a perimeter and combed the area with a K-9, but McClinton was not found. He remains at large and is wanted for felony evasion. People with more information are asked to call the Pleasanton Police Department at 925-931-5100.